Worship Pack now updated for the Stage 2 EX! I’ve been lucky to have my hands on a Stage 2 EX for the last several days and have made good use of the time updating the Worship Pack to be Stage 2 EX compatible. If you haven’t been following along, the biggest change on the hardware side is more Piano memory on the EX. For me the biggest change is a whole new set of factory synth samples – all of which had to be remapped to the Worship Pack programs! Fortunately the job is done now and I think it came out pretty well. There were a few programs that had to be reworked but I think the new changes have improved them – overall the Worship Pack is as awesome as it ever was. Check it out! There is a never ending debate between those who prefer a hardware based keyboard setup where you can happily show up at a gig with your keyboard and little else, and those who don’t mind an extra 15 minutes with a bundle of USB cables for the benefit of that 100 GB piano sample. Why choose one over the other? Lets take a look at the pros and cons of each side – we’ll start with software first. Soft synths can be the source of almost any sonic texture or instrument emulation. Many times these synths sound better than even the best hardware synths. Software based setups are common among some of the most popular worship bands and recording artists, and many times we can emulate album sounds more accurately with software. Software also provides access to synthesis techniques that may not be available on many workstations. Software setups can be upgraded a piece at a time. Software runs on many different hardware configurations and software is easier to upgrade in an incremental fashion. It is possible to achieve high quality sounds at a lower cost compared to a hardware keyboard in many cases however it certainly is easy to get carried away with constant upgrades. The entry cost for a software based setup is usually lower than a hardware configuration giving the same quality of sounds. Software interfaces can be a lot more intuitive and accessible than the interfaces of many hardware synths. If you’ve ever found yourself wandering through page after LCD page of menus on your hardware synth looking for that one setting you know is there then you understand what I mean. Well if software is so great then why isn’t everyone lugging a laptop and interface around? Hardware may have less of a corner on the market but it still has a couple of cards up its sleeve. You plug it in, turn it on, and it makes sound. Well perhaps it’s not always that simple but overall hardware provides a level of reliability that software setups still can’t match. If you can’t risk a computer crash then a reliable workstation or stage keyboard is the way to go. But wait – up there ^^ I said that software was more “economical.” The truth is it’s possible to save money either way. Hardware costs may be more up front but keyboards have a relatively long lifespan – I still occasionally use a Yamaha S80 from 1999 that holds up quite well. Synths are a good value on the used market, reducing the entry price if budget is tight. When you factor in the total cost of a software setup (laptop, host software, interface, synths) then hardware costs start to look more reasonable. Do you have a regular job? I bet you have some tools that you use every day, and I bet you can get twice as much done with them as the new guy can with his fancy gizmos. Having a hardware synth that you are familiar with can be very freeing by letting you spend more time with the music and less time with the mouse. Hardware setups can be complicated but most of them are pretty straightforward and take less time to set up and less space on stage than software based setups. If you are trying to travel light or have a tiny spot on stage to set up then hardware may be for you. Hey all, my friend Chris Gala is starting a series on his blog called Synthesis 101. We went over a lot of this stuff in some form in Pads 101 and 102 but it is always helpful to get a fresh take. Enjoy! Good news! Today I am releasing my first patch collection for the Nord Stage 2. The patches contained in the Worship Pack for Nord Stage 2 are designed to get keyboardists off and running with their Nord Stage 2 without the need to spend a lot of time in patch creation and editing. 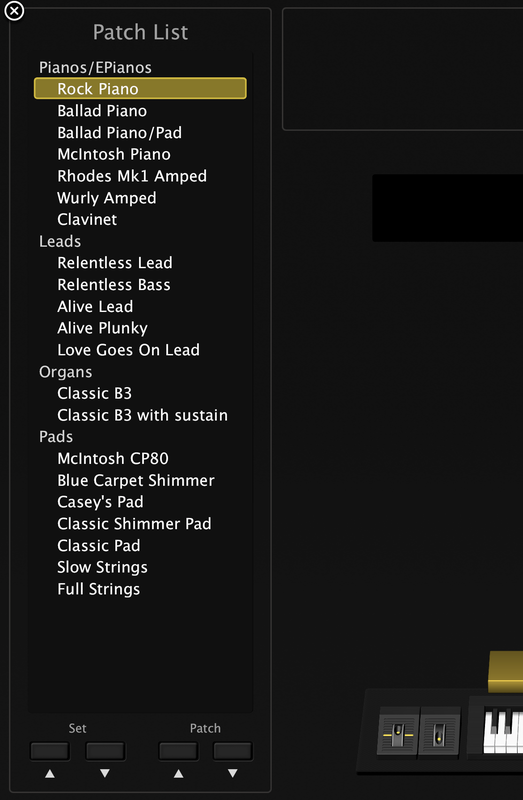 Piano presets for rock and ballads, the highly compressed piano made popular by Jesus Culture, band ready Rhodes and Wurly patches, and organ presets with the B3 novice in mind are all represented. There are also a number of synth bases and leads but the bulk of the collection is made up of pads. The biggest innovation here is utilizing the two Part structure of the Nord Stage 2 to emulate “shimmer” reverb type settings. The result is a number of patches with a sparkling high end that mesh well with modern worship styles. I also spent some time with the available strings samples in an effort to create more lush and convincing string patches. The results are several strings patches that mesh well with worship styles and offer a lot of flexibility in tone and style. Perhaps the best feature is that the Pack is designed to be “drop in” ready for a Nord Stage 2 with factory presets. This makes it ideal for musicians who perhaps play on a church-owned instrument or who want to get started quickly with updated patches on their new instrument. For those of you who have tinkered with your Stage already don’t fret! – I have included instructions on where to get samples you may have deleted as well as what type of piano substitutions to make if you prefer Pianos other than the stock set. You can find the Worship Pack at the link below, I hope you enjoy it and find it useful. Please let me know if there are any problems with it as well as any recommendations for improvements or testimonials on how it has helped you in your performances. As always, thanks for reading! Many of the people who reach this blog are searching for resources for MainStage or information on pad sounds for worship. I have a lot of material archived at WorshipMusicians.org and you can find even more material there by other members of our community. A good place to start is with my Starter Concert for MainStage. It has a number of edited/optimized patches for MainStage that require nothing beyond the default instruments and effects of MainStage 3. You can find it here.